OLLIE OTHELLA ATTAWAY was born July 05, 1892 in Suez, Comanche County, TX, and died July 03, 1964 in Eldorado, Schleicher County, TX. She was the seventh child born to John W. Attaway and Matilda Virginia Northcutt. She married JAMES ISAAC KISER November 10, 1910, son of JESSIE KISER and KATIE JONES. He was born September 18, 1891 in Mason, Mason County, TX, and died March 23, 1938 in Eldorado, Schleicher County, TX. 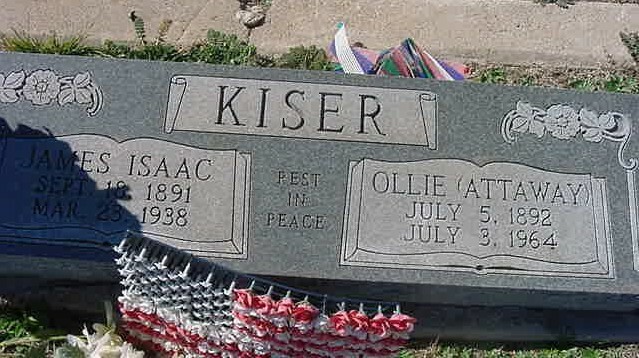 MARIE KISER b. September 15, 1911, Calf Creek, McCulloch County, TX. KATE OTHELLA KISER b. December 09, 1916, Calf Creek, McCulloch County, TX; m. (1) ROY MCSHERRY; b. April 20, 1913, New Mexico; m. (2) GEORGE HODGES, September 10, 1939; b. January 12, 1908, Mason, Mason County, TX; d. November 11, 1971. WALDO LEGGETT KISER b. June 11, 1920, Menard, Menard County, TX; m. (1) VIDA LEE CURTIS, October 28, 1945; b. October 09, 1924, Brady, McCulloch County, TX; m. (2) VIRGINIA WOODALL, June 01, 1957; b. January 27, 1923. BILLIE BOB KISER b. June 26, 1922, Brady, McCulloch County, TX; m. JOHN TALMAGE BUSHONG, July 03, 1940; b. February 16, 1918. MARY EMMA KISER b. September 23, 1925; m. LOWELL JONES, December 24, 1943; b. September 18, 1921.